Above is the gearbox used on all 502 and 503 models. The unit is a simple chain and sprocket gearbox with 3 bearings and an oil seal. The 500 gearbox is very similar but much more delicate than the 502/3 gearbox. Getting the gearbox apart without breaking it is tricky without the right tools. The only good way I have found to get the sprockets off is to spray them down with penetrating oil for a few days and then use a bearing separator (upside down) in a press. Do not press on the bearing retainer as it will bust easily. It also squashes the aluminum spacer between the bearing retainer and sprocket. 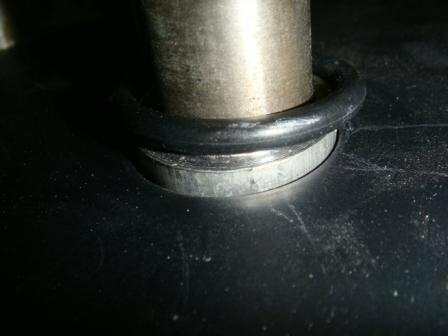 The bearing separator needs to be installed in a way that the pressure from the press is forcing down on the inner sprocket hub and not out around the rubber. Pressing the sprockets off by supporting near the rubber will surely wreck the sprockets. 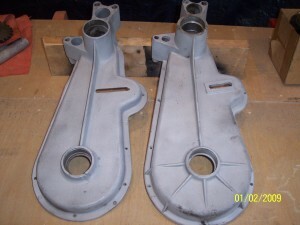 - The 500 gearbox housing is much more delicate than the 502/3 gearbox. Improvements on the later housing includes more cover bolts (increased from 8 to 11), a cover that has edges folded in toward the gearbox housing, thicker aluminum around the lower bearing (from 1/8″ to 1/4″), a wider seal hub on the driven sprocket (from 11/16″ to 1-1/4″), reinforcements around the idler sprocket along with a central location design, gussets on the outer housing and an additional lube fill hole on the top. Note: you may come across a gearbox from a 500 that has 9 or 10 cover bolts. I suspect there were gearboxes made late in the 1967 production year as Bolens observed problems with leaks and tried to resolve the issue by adding more cover bolts. - The center to center distance between the input and output shaft are different. 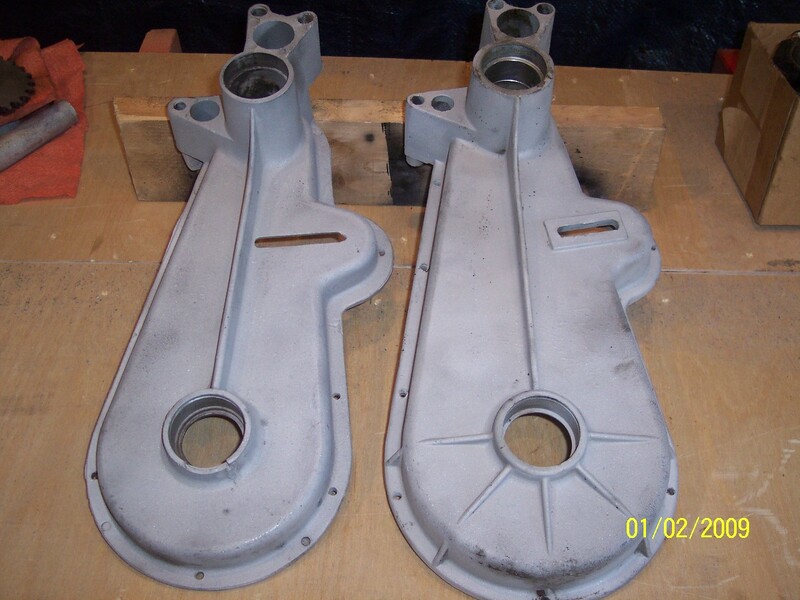 The 502/3 gearbox has about 1/4″ more distance between the two shafts. – The gear ratio is different. The 500 has a 9 tooth drive sprocket and 26 tooth driven sprocket giving it a gear ratio of 2.88:1. The 502/3 has a 10 tooth drive sprocket and 28 tooth driven sprocket giving it a gear ratio of 2.8:1. All things being equal with engine RPM, clutch condition and belt wear, the 500 should have had slightly more power but less speed than the 502/503. 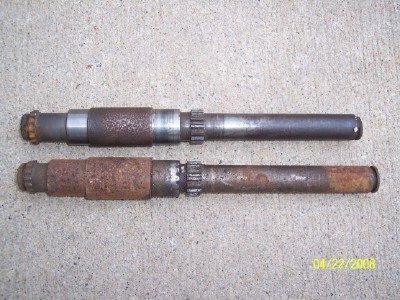 The input shafts are different between the 500 & 502/3. 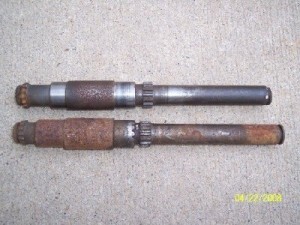 The left picture shows the 500 shaft above (9 5/16″ long) and the 502/3 shaft below (9 3/4″). The gear splines look similar, but I don’t think they are the same. The weak link is the spline for the connection between the brake disc and shaft. It often wears out. #50 Rex chain is used in both gearcases. All the bearings in the gearbox along with the two track adjustment bearings are 6205-2RS (five total – this is a standard bearing number supplied by most bearing manufactures and measures 52mm x 25mm x 15mm wide). 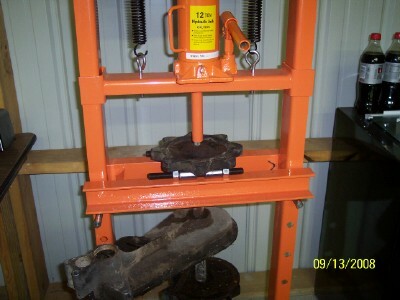 A National 204503 (one required) is used in the gearcase cover. However, another seal that is the same inside and outside diameter but thicker is a Timken 473237. The thicker double lipped seal puts more rubber on the sprocket shaft creating a better seal (Thanks for sharing this Barrie). The remaining dis-assembly is fairly straight forward. 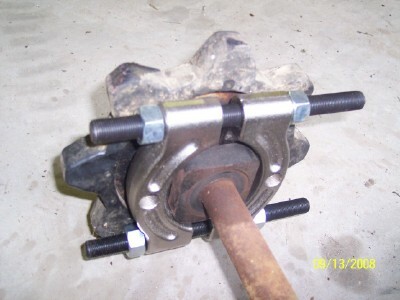 The input shaft can be pressed out either direction after removing the snap ring. Support the housings and press out the bearings. The sprockets usually come off with little effort. Although the 500 and the 502/3 gearboxes are different, they come apart the same way. Note where the spacers are. - The 500 gearbox has a 5/8″ spacer behind the Driven Sprocket and a 1/2″ spacer behind the Drive Sprocket. - The 502/3 gearbox has 7/16″ spacers behind both Sprockets. - Both gearboxes have a 7/8″ spacer between the Drive Sprocket and the Secondary Clutch. - Both drives have spacers with a ring cut in them between the bearing retainer and the Rubber Drive Wheels. I found four places of leak propagation in the chain case. 2. 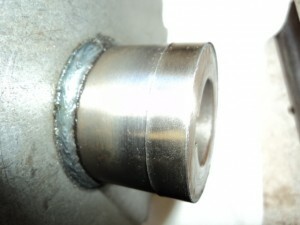 Sealant MUST be used on the overlapping seam of the lower case and at the flange unions. 3. No seal is engineered into the upper chain case clutch side of the input shaft…NONE! So an O-ring must be installed to reduce seepage. 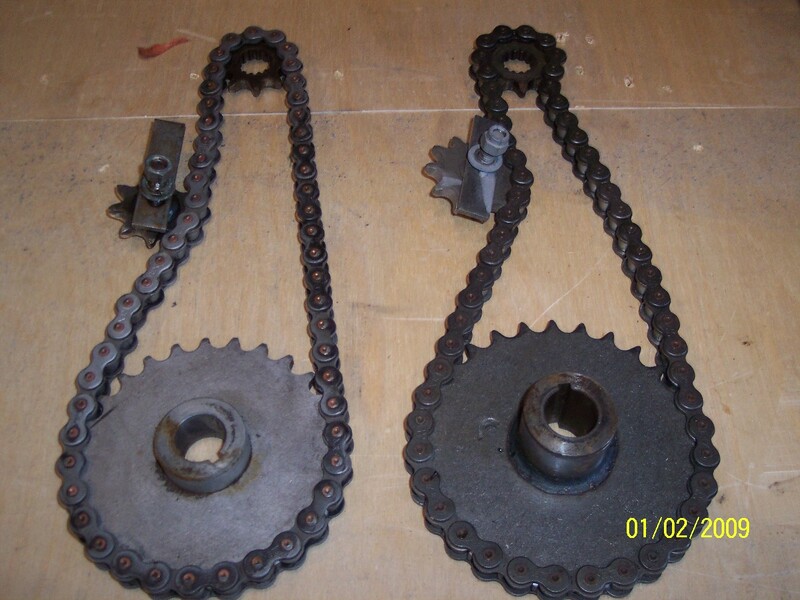 All the chain case bearings are common pieces and should be replaced with sealed, self lubricated ones. 4. The chain tensioner stud-plate has no sealing means whatsoever to retain gear-lube so chain tension must be set before final case assembly with the chain-tensioner plate being thoroughly gooped for sealing. 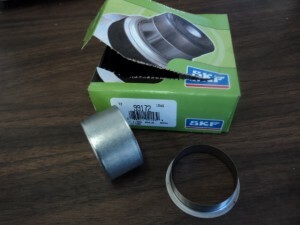 This also preloads the lower sprocket bearing properly to locate it for best concentric sealing in the feeble seal that’s available for that odd-sized application. Barrie shared this picture of the gaskets he makes. 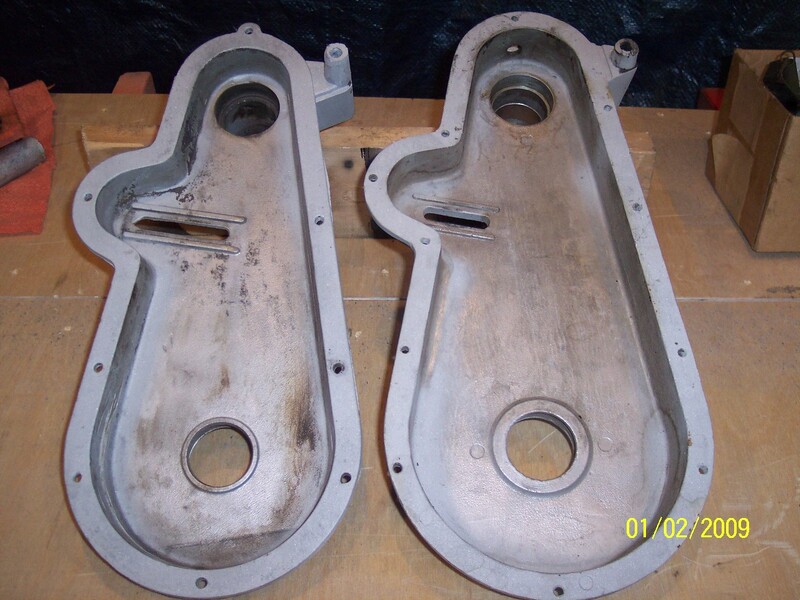 Get thin gasket material otherwise when assembled, the seal retaining plate and the seal will be pushed outward resulting in a seal surface barely touching the shaft. 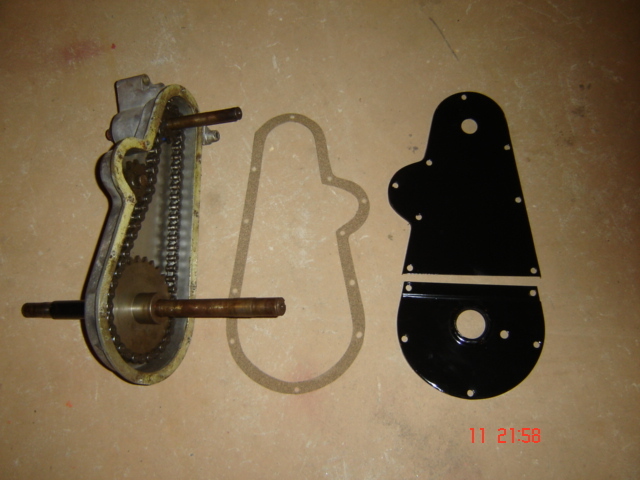 While apart, lay the gearcase on the gasket material and draw the outline of the housing on to the gasket. Cut it out and put the holes in and whala! A new gasket. There are times when the rubber seal in the case cover severely grooves the mating surface of the Driven Gear. 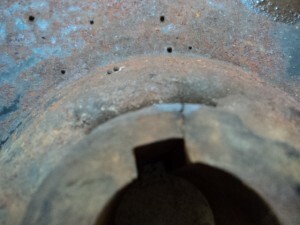 Often a result of a gearbox running low on oil or even dry. The fix for this is to press on an SKF product called a Speedy Sleeve. The size is an 1 3/4″ or 1.750″ sleeve and you can get them in three lengths. Once installed, the seal surface is like brand new. 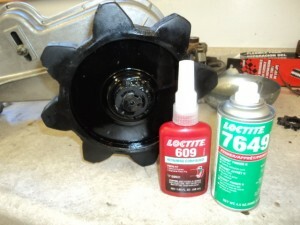 Lubrication is accomplished by filling the gearbox with 6 ounces of 90W gearcase lubricant. Some of the original manuals suggest 90W/140W, but I’ve always used 90W without a problem. 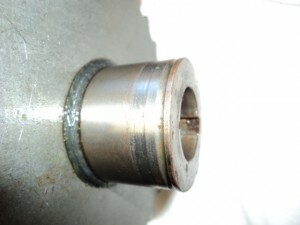 Note that the 6 ounces of oil is not enough lubricant to reach the fill hole in the side cover of the gearboxes. If you fill the gearbox to this level, it’s guaranteed to leak no matter how many upgrades you make to it or how much silicone you use to put it together. So the question is, how do I know if I have enough lubricant in the gearbox? If you are lucky enough to have a gearbox that does not leak, you should still check the level by rolling your Diablo across the floor a few feet and then pulling the top plug out of the gearbox (502/3 gearboxes have this top plug) and verify there is fresh oil on the chain. If there is, you are good to go. 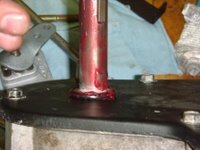 If you have a leaky gearbox, this becomes more important to check often using the same procedure as above. Adding a couple of ounces a few times a year to a leaky box is not a bad idea, but don’t overdue it or the extra oil just makes the problem worse. If you have a 500 gearbox that does not have the top hole, then add a hole. Just drill through the top of the gearbox being careful not to punch through the top right into the chain within. 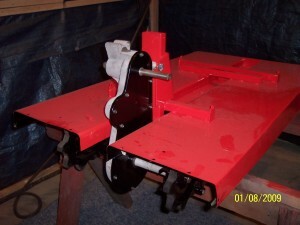 The chain is right next to the aluminum cover internally, so drill slowly. If you put a vacuum near the hole while drilling, you should be able to keep the aluminum chips out of the hole. Once drilled, put a cap or plug in the hole. When refurbishing your Drive Sprockets, be on the look out for cracked hubs. 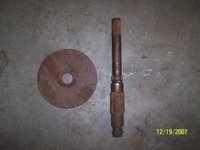 This can happen when the keys get a little loose and allow the sprocket to rock on the shaft. When the hubs snap, they loosen up because the bore springs open almost 0.010″. Putting the sprockets back on the shaft loose is a short term assemble. Without the press fit of the bore to the shaft, the key will rock and eventually shear or pop out and leave you on the trail with only one track spinning. The best fix for this problem is to replace the hub. 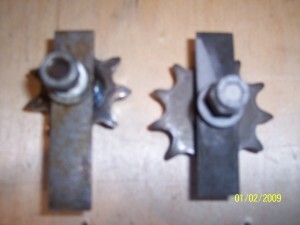 The drive sprocket and the idler sprocket uses the same sprocket hub. The only difference is the drive sprocket has two of these keyed & bored out hubs pressed and welded into each side. By grinding off the welds and punching out the hubs, you can replace them with new. In addition to replacing the hub, use 609 Loctite and Primer on the mating surfaces. The combination of the new hubs to tighten the fit along with the Loctite to fill in the gaps makes a sloppy fit tight again and hopefully keeps you rolling in the snow.